First, thank you for continuing to visit my site while I was taking a physical, mental and spiritual rejuvenation! I so appreciate each and every one of you, thank you! The season of the Farmer’s Market! Anxiously anticipating this week for so long, now I can have fresh vegetables, fruit along with the fabulous vibrant colors! Managing my fruits and veggies to make sure to have room for the “fresh” and local produce anxiously anticipated walking and selecting my treasures. Oh my trainer will be so excited that I am out and about purchasing color! There are Farmer’s markets all over the area and they are on different days but yesterday the market was right in my town center, convenient and a chance to mingle with my neighbors. Armed with small bills in my pocket to make it easier for the vendors to make change, sunglasses on, hat on and ready to take my 2 minute walk outside my complex and select my fresh items! As I walked I was so excited sensing the fresh taste of the tomatoes, the sweetness of the corn, the bite of the onion and the delicious and juicy peaches or crunchy apples that would soon be mine! Walking with purpose I entered the beginning of the market. What did I find? Well, let me tell you my experience! Hot Sauce was the first vendor – its 87 degrees, I live in a desert though I love hot sauce I have plenty in my pantry, thank you very much! Creams- not the moo kind- the spa kind- listened how in LA these are sold in the high end spas for $300 a jar- pulling off my shades I reminded him that he wasn’t in LA and asked: What is the local price. $75.00! I was trying to imagine, given these were natural ingredients how this would fit into my salad- NOT… next???? Continuing to walk through the market there are garden ornaments, OK it would help if I had a garden, if I did I certainly wouldn’t be walking through what is suppose to be a Farmer’s Market….. Help!!!!! After numerous more vendors finally at the end of my trail are two- repeat two stands of produce. Shallots, carrots (the Mr. Green Jeans type) and Brussels Sprouts- Seriously? Are you kidding me? Apples- yes ! What? Candied apples dipped in Carmel or chocolate- peanuts or no peanuts… No thank you! Success I did walk away with Peaches for desert!!! As I walked away I turned around and looked with disappointed as to what I had just experienced. OK I am always optimistic, so the bread is gluten free, the clothing may be organic and the creams may be natural ingredients, peanuts may be healthy, Beer may be from a local micro brew, jelly is an extra income source for a local family and the hot sauce? The hot sauce is just plain not in any category in my opinion. What has happened to our local Farmer’s Markets? 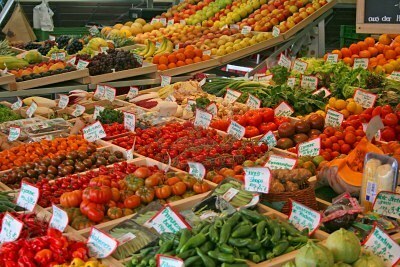 Where are the fresh greens, fruits, vegetables, the color that represents nutritional healthy living? I am all for the above items and also for local authors and artists, but PLEASE throw in a few fruits and vegetables “for Pete’s Sake”…… Walking home I was sad to think that now I had to have my chicken solo and naked… not a good combination in my opinion. So today I went to the local grocery store and bought all the fruits and veggies that brought color, laughter, nutrition and good tastes into my home. I created my own farmers market!! Time for me now to go fix my corn, build my salad with all the goodies and enjoy the colors and delicious savory tastes!! Perhaps next week the selection will be bigger as the weeks go on and the growth continues……….